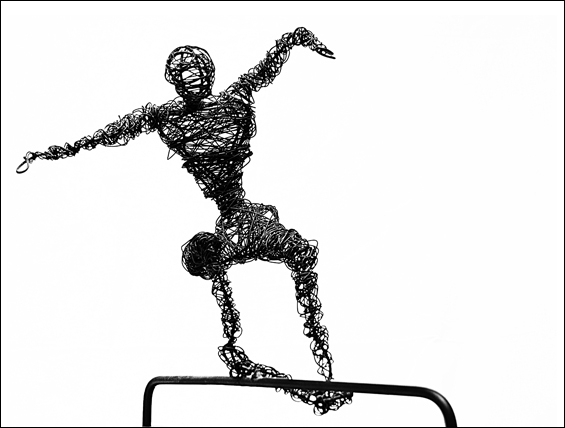 This skateboarder is made completely out of black wire. Adjusted exposure, black, usm, crop, boarder, save for web. I was not able to vote on this challenge, but if I had, I probably would have given you a 6. I really like clean and simple photographs, so my first impression is that this is great. I like the sharp contrast in black & white tones, and the texture of the wire is interesting to look at. This is a different type of personification that most entries in this challenge. Many people have used inanimate objects and posed them to give them a personality, while you have created (or found) a person made from an inanimate object. While it is a nice photo, there isn't a cleverness as seen in some of the other photos, and therefore it doesn't hold my interest for very long. Perhaps seeing the statue up close and personal in real life would be a little more interesting. Excellent bw. Did you make that? Proudly hosted by Sargasso Networks. Current Server Time: 04/25/2019 10:43:13 AM EDT.